A 6-year-old girl presented with blurred vision and was found to have elevated intraocular pressure (IOP) and glaucomatous optic disc damage in both eyes. She also displayed capillary malformations on the face (port-wine stain), upper back and all four limbs, angiomatosis in the brain and had hypertrophy of the left upper and lower limbs typical of overlapping Sturge–Weber syndrome and Klippel–Trenaunay syndromes. She was initially managed with IOP lowering topical medications but required trabeculectomy in the right eye followed by Ahmed valve implantation in both eyes. Despite multiple measures over a 7-year period, her IOP still remained uncontrolled with gradual progression of the glaucomatous damage. This case exhibits a very rare occurrence of overlapping syndromes reported only a handful of times in literature. Most cases with Sturge–Weber syndrome have ipsilateral glaucoma affecting the eye on the same side as the port-wine stain. This case presented with bilateral refractory childhood glaucomas, which is exceedingly rare. We report a case of a 6-year-old girl who presented to our clinic with overlapping features of both these syndromes and bilateral refractory glaucoma. We also describe the clinical course, surgical management, and long-term outcomes over half a decade of follow-up. A 6-year-old girl complained of diminished vision in both eyes for 3 months. The past medical history was significant for complex partial seizures for which she was on oral carbamazepine for the last 3 years. Her best-corrected visual acuity (BCVA) in both eyes was 20/32. Anterior segment evaluation of both eyes was unremarkable except for a scleral nevus seen in the left eye [Figure 1]a. Fundus examination revealed a cup to disc ratio of 0.7:1 in the right eye and 0.6:1 in the left eye [Figure 1]b. On applanation, tonometry intraocular pressure (IOP) was found to be 36 and 38 mmHg in the right and left eye, respectively. A four mirror gonioscopy revealed open angles with dense iris processes and increased trabecular pigmentation in both eyes. Central corneal thickness was 551 μ in both eyes. GDx with variable corneal compensation revealed significant retinal nerve fiber layer thinning in both eyes. The retinal examination was normal and did not reveal any choroidal hemangiomas. Physical examination revealed erythematous lacy capillary network-like lesions over the face (port-wine stain) [Figure 2]a and all four limbs. Hyperplasia of the gingiva [Figure 2]b and reddish discoloration of lips, tongue, tips of fingers, and toes [Figure 2]c were noted. In addition, extensive bluish discoloration of the skin was seen over the upper back. 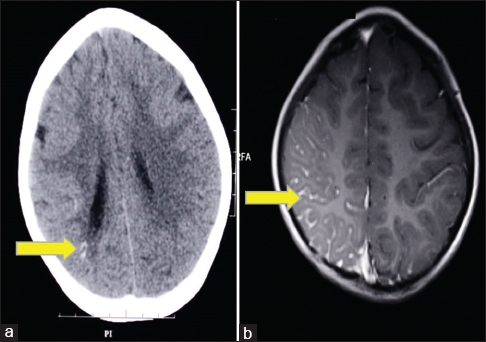 Her left upper and lower limbs showed mild hypertrophy [Figure 2]d.
Magnetic resonance imaging of brain and neck showed enhancement of pial angiomatosis in the parieto-occipital region, greater on the right side [Figure 3]. Magnetic resonance angiography revealed congenital hypoplasia of the right internal carotid artery (ICA) and vertebral artery with compensatory enlargement of the left ICA and vertebral artery. Prominent medullary collaterals with hypoplasia of right parietal cortical vein were also observed. She was started on timolol eye drops 0.5% at baseline and pilocarpine eye drops was added after 5 months in both eyes. Despite this, IOP remained high in the right eye for which she underwent trabeculectomy with Ologen implant in the right eye after 2 months. However, after 2 years, there was bleb fibrosis and failure of trabeculectomy, so the patient underwent an Ahmed Glaucoma Valve (AGV) implant surgery in the right eye. The left eye also showed poor IOP control after 4 years of topical medication with travoprost 0.001%, dorzolamide 2%, and timolol 0.5% eye drops, and underwent AGV implantation. On follow-up visits, the BCVA was maintained at 20/32 in both eyes. The IOP was 16 and 20 mmHg in the right and left eye, respectively. On subsequent visits, both eyes showed a well-formed conjunctival bleb around the AGV footplate and required only timolol for optimal IOP control. On the last follow-up visit, 2 years post-AGV, the IOP was 26 mmHg in the right eye and 32 mmHg in the left eye with a cup to disc ratio of 0.8:1 in the right eye and 0.7:1 in the left eye despite being on topical travoprost and timolol. We describe a rare case of overlapping Sturge–Weber and Klippel–Trenaunay syndrome with secondary glaucoma. Although the association of Sturge–Weber syndrome and ipsilateral glaucoma is relatively well established, the coexistence of vascular malformations beyond the distribution of the trigeminal nerve and its influence on the IOP control have not been reported frequently. In addition, the glaucoma is ipsilateral to the port-wine stain in most cases, and bilateral affection is exceedingly rare. Glaucoma in these syndromes is attributable to malformations of the anterior chamber angle or high episcleral venous pressure. We believe that a combination of underlying genetic factors in overlapping syndromes may alter the composition or ultrastructure of the trabecular meshwork in, as yet, unexplained ways. These variations may, in turn, make the glaucoma more refractory to medical and surgical management, as evidenced by our case where, over a period of 7 years, the child initially responded favorably, in terms of IOP control, to both trabeculectomy and AGV but gradually tended to become refractory again. The child had convulsions for 3 years before presenting to us with trivial symptoms. Even though the child displayed copy– book systemic features, the diagnosis of the coexistent syndromes and glaucoma was only identified after the ophthalmic examination. Ophthalmologists should keep a high degree of suspicion to identify syndromic associations of childhood glaucoma and alert their pediatrician colleagues of this possibility. We present a very rare case of overlapping Sturge–Weber syndrome and Klippel–Trenaunay syndrome with bilateral refractory glaucoma that was managed both medically and surgically over a 7-year period, but despite our best efforts, the IOP remained refractory, heralding a guarded prognosis. We acknowledge the inputs by Dr Sabyasachi Sengupta from Sengupta 's Research Academy, Mumbai in Content Editing and English prose. Purkait R, Samanta T, Sinhamahapatra T, Chatterjee M. Overlap of Sturge-Weber syndrome and Klippel-Trenaunay syndrome. Indian J Dermatol 2011;56:755-7. Lee CW, Choi DY, Oh YG, Yoon HS, Kim JD. An infantile case of Sturge-Weber syndrome in association with Klippel-Trenaunay-Weber syndrome and phakomatosis pigmentovascularis. J Korean Med Sci 2005;20:1082-4. Abdolrahimzadeh S, Scavella V, Felli L, Cruciani F, Contestabile MT, Recupero SM. Ophthalmic alterations in the Sturge-Weber syndrome, Klippel-Trenaunay syndrome, and the phakomatosis pigmentovascularis: An independent group of conditions? Biomed Res Int 2015;2015:786519. Sullivan TJ, Clarke MP, Morin JD. 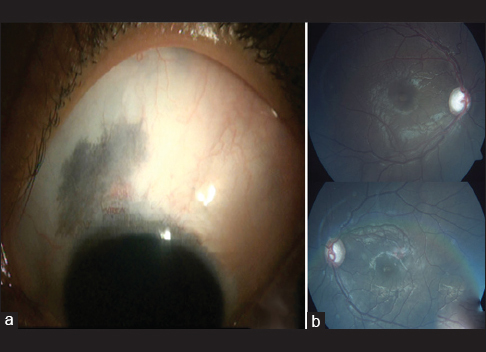 The ocular manifestations of the Sturge-Weber syndrome. J Pediatr Ophthalmol Strabismus 1992;29:349-56. Shirley MD, Tang H, Gallione CJ, Baugher JD, Frelin LP, Cohen B, et al. Sturge-Weber syndrome and port-wine stains caused by somatic mutation in GNAQ. N Engl J Med 2013;368:1971-9. Vahidnezhad H, Youssefian L, Uitto J. Klippel-Trenaunay syndrome belongs to the PIK3CA-related overgrowth spectrum (PROS). Exp Dermatol 2016;25:17-9. Luks VL, Kamitaki N, Vivero MP, Uller W, Rab R, Bovée JV, et al. Lymphatic and other vascular malformative/overgrowth disorders are caused by somatic mutations in PIK3CA. J Pediatr 2015;166:1048-54.e1-5.